Do your little ones ask "What is honey?" Singapore, Singapore (PressExposure) January 27, 2009 -- In our modern urban living environment, don't be surprised when your kids say they know where the sweet liquid, honey comes from – the store shelves. Perhaps that's not a totally erroneous answer, but it will be a concern when you realise that they could not trace back the origin of honey further than the shops. 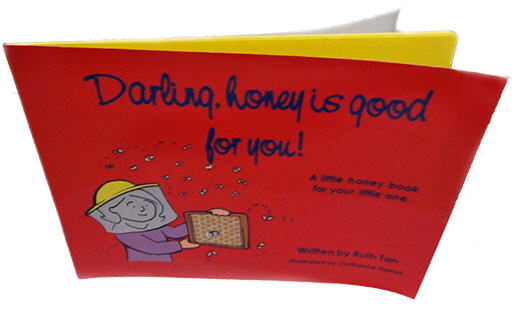 Ruth Tan of Benefits of Honey has written and published a book entitled "Darling, Honey is Good for you!" to take children aged 3 to 6 years old on a journey to discover and see where honey comes from. Presented in a language simple enough for young kids to easily understand, this book explains what honey is, where it comes from, how fascinating bees are, how beekeepers collect honey, the goodness honey brings, and even includes a simple honey recipe for kids. Now available for sale in Amazon, Darling, Honey is Good for You! contains 26 full-colour pages with many lively, endearing illustrations that will capture the eyes and engage the hearts of young readers. Parents can use this book as an excellent educational aid to read aloud to their little ones and explain about bees and honey, and even encourage them to take honey as a health food. Ruth Tan runs the popular website Benefits of Honey which is an immensely rich, quality resource on honey and its benefits, and a plethora of health-related issues. Discover the amazing health benefits and all the positive spin-offs super-food honey can bring to your life and the lives of your loved ones at https://www.benefits-of-honey.com. End of What Is Honey? "Darling, Honey is Good for You!" Explains. Back to "Honey Bees for Kids Book".